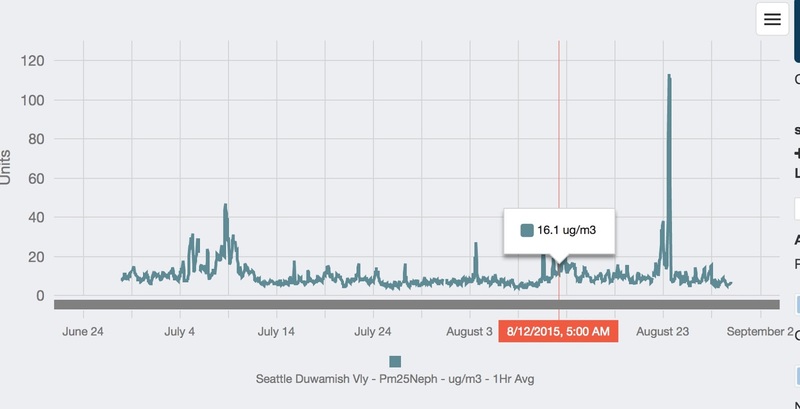 Western Washington's summers are nearly always quite dry, but this summer is unusually so. And looking at the precipitation anomaly (difference from normal) over the past 90 days for WA state shows near normal precipitation over the Columbia Basin, but a dry western Washington, with the windward slopes of the Cascades being roughly 3-5 inches below normal. To get some historical perspective, here is the May to July precipitation for Washington State since 1930. 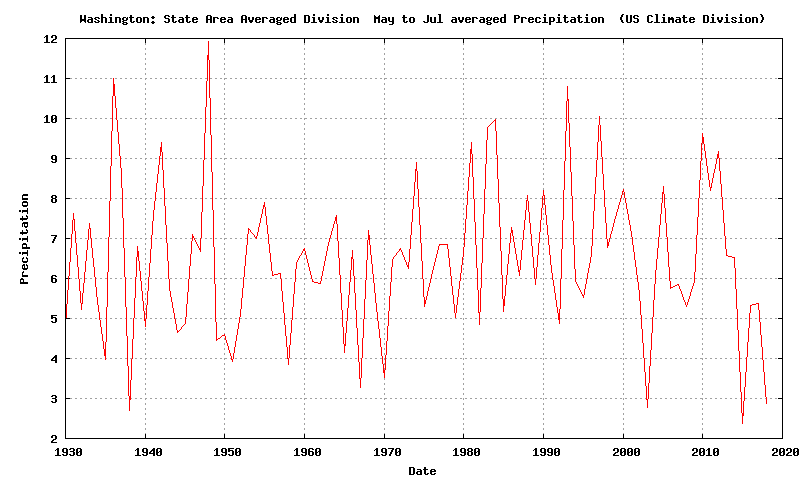 This year was not a record low, but was one of the driest years during that period. Overall, there has not been much a long-term trend in early summer precipitation, but we have had a drier than normal spell the last few years. The good news is that the models are showing the return of light rain to our area. For example, here is the forecast cumulative precipitation through next Friday using the UW WRF model. Decent rain in British Columbia, which is very good--can help dampen down the fires. And western Washington gets moistened, particularly the western side of the Cascades. Regarding the holiday weekend, it should be dry through Sunday night, but then a upper level trough moves in. So expect some light showers Monday AM that will be over by noon. And then on Thursday a potent upper trough approaches (see below)...expect substantial cloudiness and some rain later on Thursday into Friday. In short, normal conditions are back. Heat waves and smoke are in our rear-view mirror. Air quality today is far better over the region today that last week, but some smoke is present and will stay present. Here is the latest surface particulate map from the wonderful Washington State smoke website : http://wasmoke.blogspot.com/. Most of the sites are green (good air quality)....but there are problem spots. 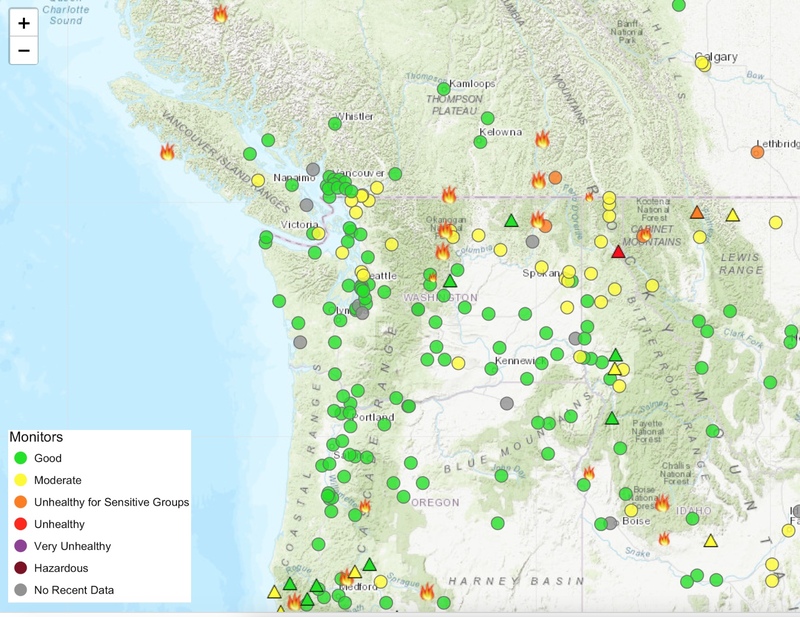 Because of the Maple Fire on the Olympic Peninsula and persistent wildfires on northern Vancouver Island, some smoke is getting into western Washington. 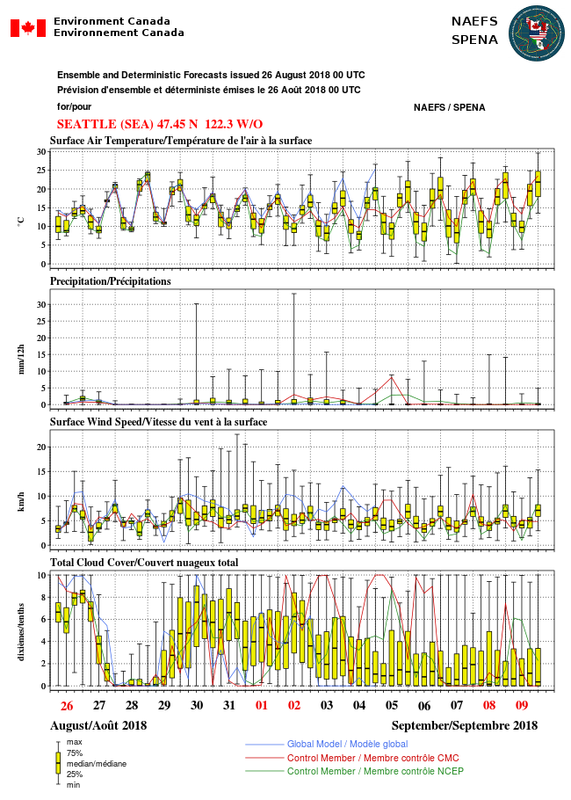 That is why a few central Puget Sound sites are reporting moderate levels (but on the low level of moderate). And the persistent fires on the northeast slopes of the Cascades are producing moderate to unhealthy values there. This pattern is going to stay in place for the next week, based on on the latest model runs. 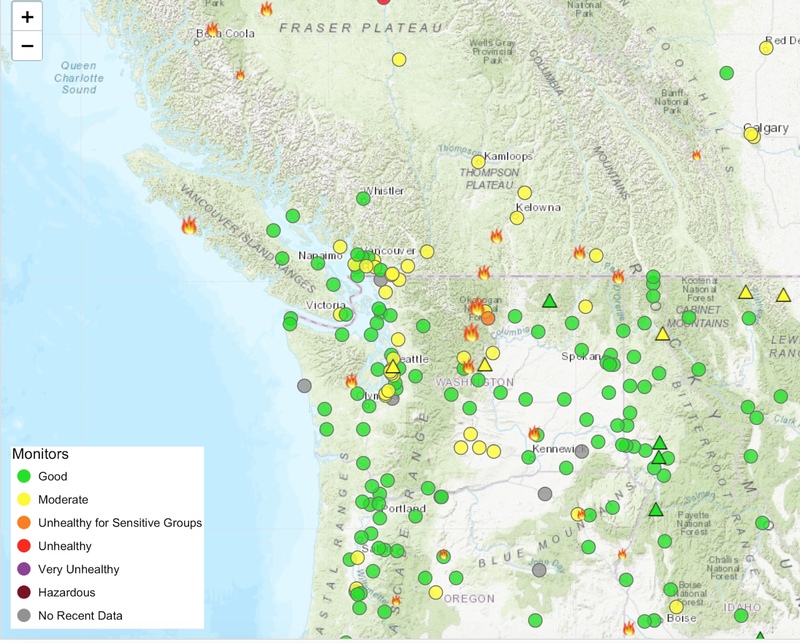 Forecasts are for the maintenance of a ridge of high pressure offshore and generally northwesterly flow--no heat wave--but the Vancouver Island smoke can waft into western Washington. To illustrate, here is the forecast map for upper level (500 hPa) flow at 5 PM Saturday. No heat wave. Generally onshore flow. 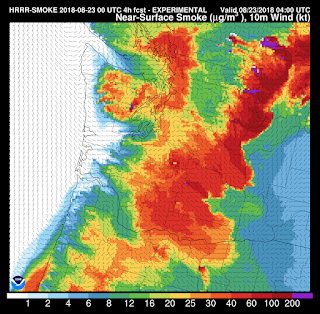 The entrance of clouds into our region has revealed a problem with the NOAA/NWS HRRR smoke model I have shown in previous blogs. It bases its fire location on satellite data (like VIRS) and when clouds occur, the fires are not well defined. The Canadian smoke model seems to do better. 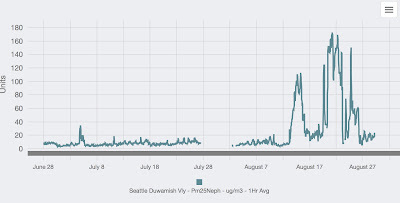 I suspect that we have seen the worst of the smoke for this season here in western Washington, so it is useful to view a trace of air quality at Seattle to get some perspective (see below for June 28th through today). 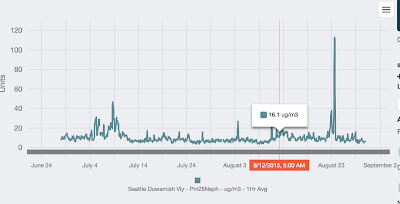 Particulate levels (PM2.5) were relatively low through approximately August 10th (although there was a small spike on July 4th). 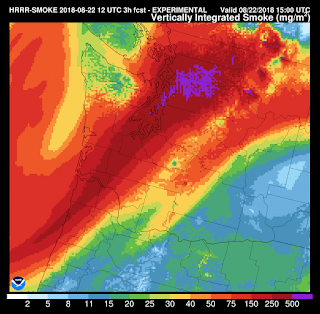 We had two weeks of smoke, with some peaking into the very unhealthy range (above roughly 120). Now we have settled down into low-moderate level (roughly 15-20)-- some smoke, but far down from the previous peaks. It is interesting to compare this against recent years. For 2017, there was a two week period in early August, that was bad, but not quite as bad as this year. And 2015, a much warmer year that this one-- a summer similar to what we expect during the 2070s, had far less smoke that this year. 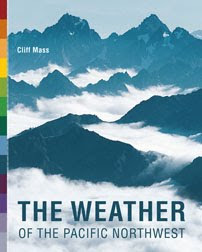 Clearly, there are subtleties to the connection between smoke and weather, something I will explore in a future blog. Over the weekend, I flew down to California with graduate student Brandon McClung, to view the recovery from the catastrophic wine country wildfires of October 8-9, 2017. 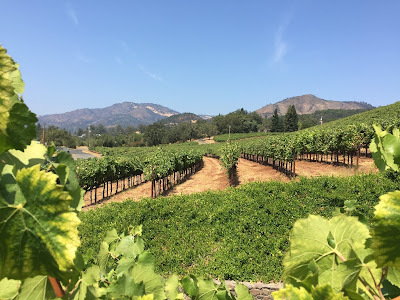 I have become very interested in West Coast wildfires and have completed a paper on the meteorology of the Wine Country fires and the winds that initiated them: the Diablo winds. I found the trip both scary and highly informative. As many of you remember, the Wine Country fires occurred on October 8-9, 2017, with most of the damage associated with four major fires (see map below) north of San Francisco. 44 people died, thousands of homes were destroyed, and insured damage was around 10 billion dollars. Total loss was probably 50-100 billion. 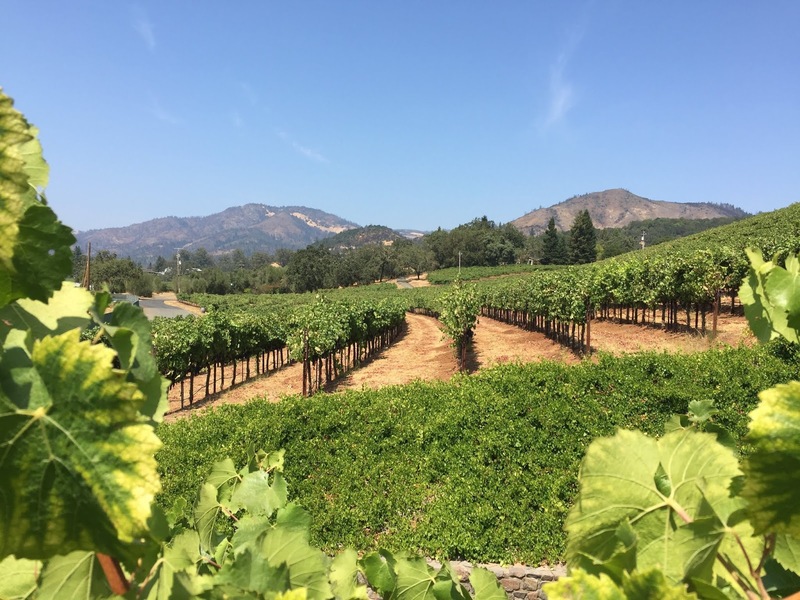 The wine industry only experienced minor losses and our travels through much of the fire territory showed lush fields of grapes and crowded wineries and support businesses. But then we entered the fire zones, where there were a lot of surprises. One surprise was that the trees were really not consumed, but blackened. There would be yellow/dead leaves but many of the trees were still alive, with some green leaves at the top. A thick growth of grass had clearly grown during the spring, and small plants/bushes were evident. 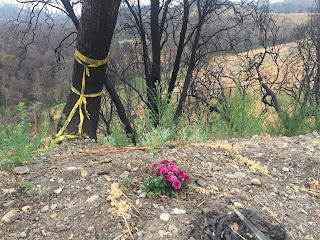 In some places flowers were coming up, even among the charred trees. 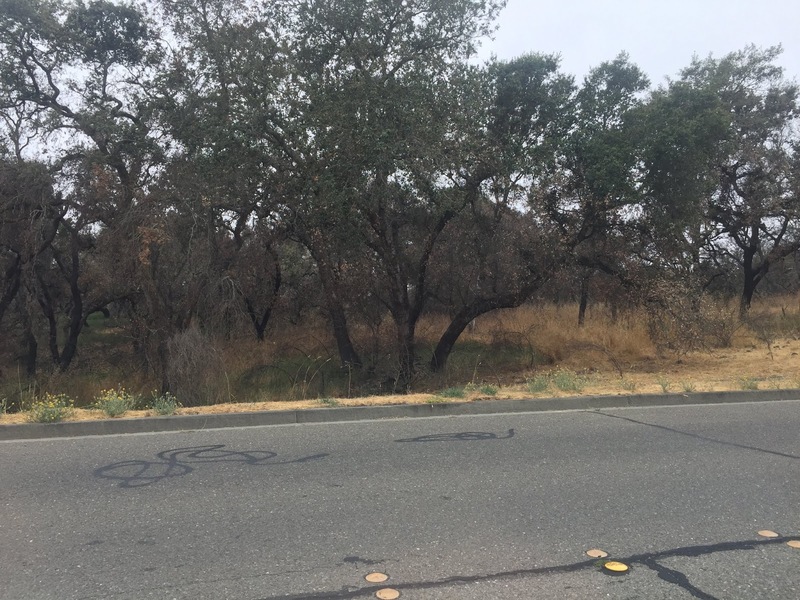 Clearly, the chaparral vegetation is highly robust to fire and was coming back quickly. I bet that in five years it will be hard to tell that the fires even occurred. But then we entered some of the burned out neighborhoods of Santa Rosa, and the scene was apocalyptic and disturbing. 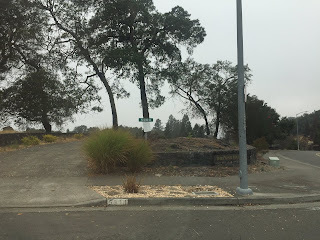 Hundreds of burned out lots, with nearly all the fire debris removed. The remains of swimming pools and brick patios, but no houses to go with them. Desolation as far as the eye could see. I really felt bad for the people that lived there before--it was like a war zone. Such neighborhoods are an example of the wildland/urban interface that might not be appropriate for building. 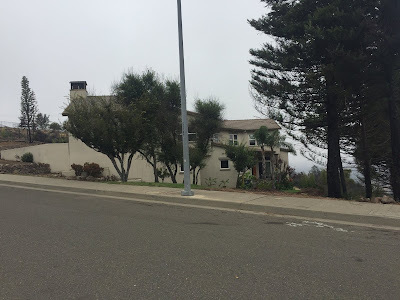 But if you are going to live there, you need to have a house and surrounding designed to handle such fires. We did see some new houses going up, and they looked like traditional construction. Not good. We also hiked above Berkeley, California in the hills that have produced huge, destructive fires, like the Tunnel Fire of 1991. Terribly overgrown with non-native and flammable Eucalypus trees and dry grass everywhere (see picture). There will be more fires there someday. My take away from all this is that the chaparral vegetation of the region appears highly robust to fires, and that there is a huge population living too close to fire-prone hills. 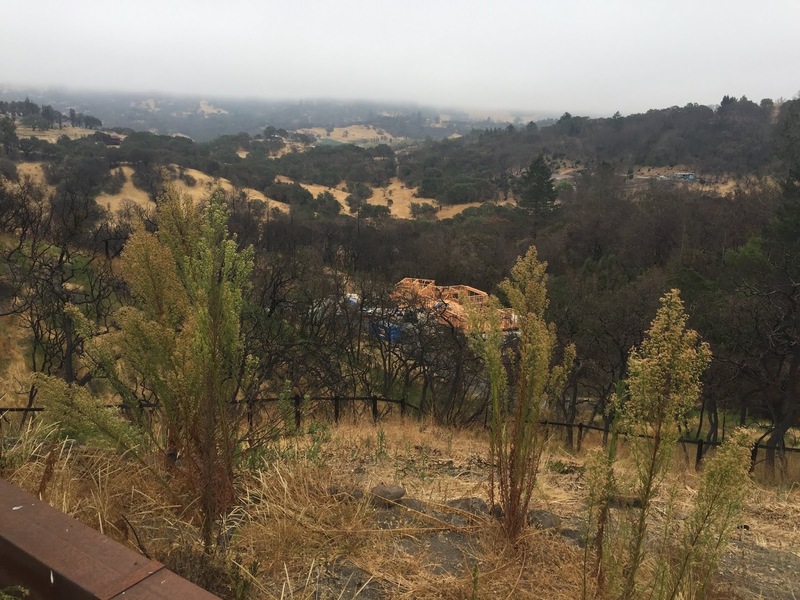 My research deals with predicting the winds that produce the big fires of the region...that could help save lives, but too many folks are living in locations that have burned for millennia and will burn again--even under the "old normal." With the upper level trough passage today, increasing onshore flow and rain has greatly cleaned up the air over the entire region. 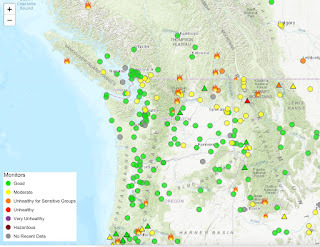 In fact, as shown in the figure, the air quality over the Northwest hasn't been this good in months (green is the best). The latest long-range ensemble forecasts (running the models many times) suggests no heat wave (over 80F) for the next two weeks (the US/Canada NAEFS ensemble is shown below, temperatures are in °C, with 20C about 68F). And by mid-September the sun is weakening rapidly, so the chances of major heat declines. Although we undoubtedly will get a taste of more Canadian smoke this week, concentrations will probably be modest. Northwest Wildfires: Are We Seeing a "New Normal" Due to Climate Change or The "Old Normal"? 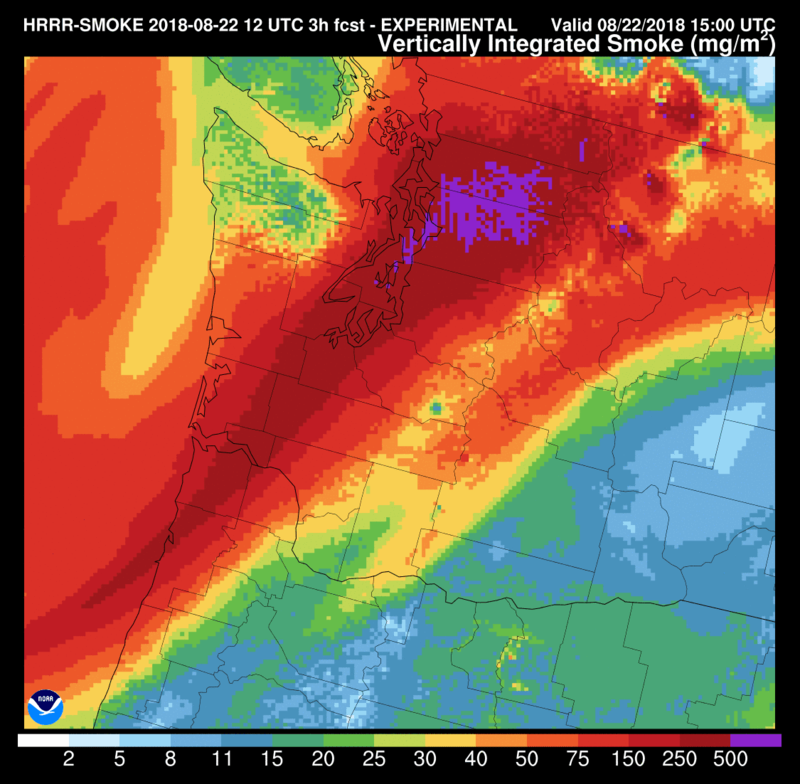 Some of the news media, politicians, and environmental advocacy groups have claimed that the smoke hitting western Washington during the past two summers are a "new normal." 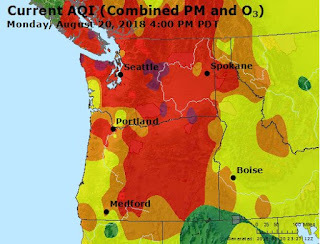 That Northwest summers should be smoke and fire free, and that anthropogenic global warming has created a new regime of fires and smoke that has never been experienced before. Wildfires are an essential part of the ecology of our region, particularly east of the Cascade crest. When European settler reached the region in the 1800s they found an area that was frequently smoky in summers, with major fires. And the reason that current inhabitants of the region think smoke is an outlier is because of nearly a century of fire suppression in the West. To put it succinctly, during the past few summers we have gotten a taste of the "old normal", one that was very familiar to our great grandparents and their predecessors. And one that we will experience frequently in our future if we don't take steps to restore our forests and to bring back regular fire. 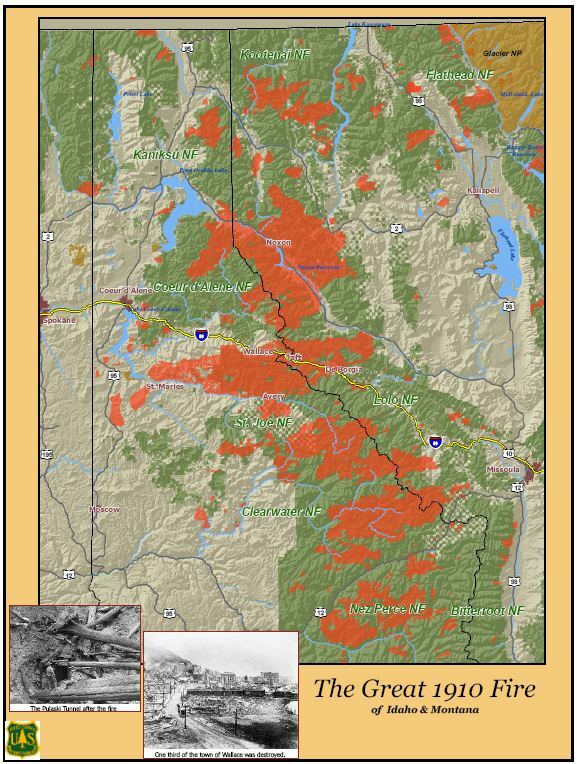 An excellent illustration of our firey and smoky past is found in this graphic produced by the Oregon Department of Forestry (OD) showing acres burned and number of fires from 1911 to 2017 (see below). The number of acres burned early in the 20th century absolutely dwarfs when are experiencing recently. And there has been no increase in the number of fires. During the 1940s, we got good at suppressing fires (with new technologies such as airplane drops of water/retardant) and the number of fires dropped precipitously, with a modest recent rise (but nothing compared to the 1917-1940 period). Smoke and fire was part of life here in the Northwest before the period of near-total suppression began around approximately 1940. Native Americans started fires to encourage the productivity of the land. The early settlers of the region experienced one major fire (with lots of smoke) after another. Some examples will illustrate. In 1844, a wildfire approached and almost destroyed Fort Vancouver, north of present-day Portland. A year later, the Great Fire of 1845 burned down the north half of Lincoln and the south half of Tillamook counties destroying most of the old growth timber of the area (1.5 million acres). In 1853, the Yaquina fire engulfed 450,000 acres in Oregon, followed by the Silverton Fire of 1865 (million acres in Oregon) and 1868 Coos Fire (Oregon, 300,000 acres). 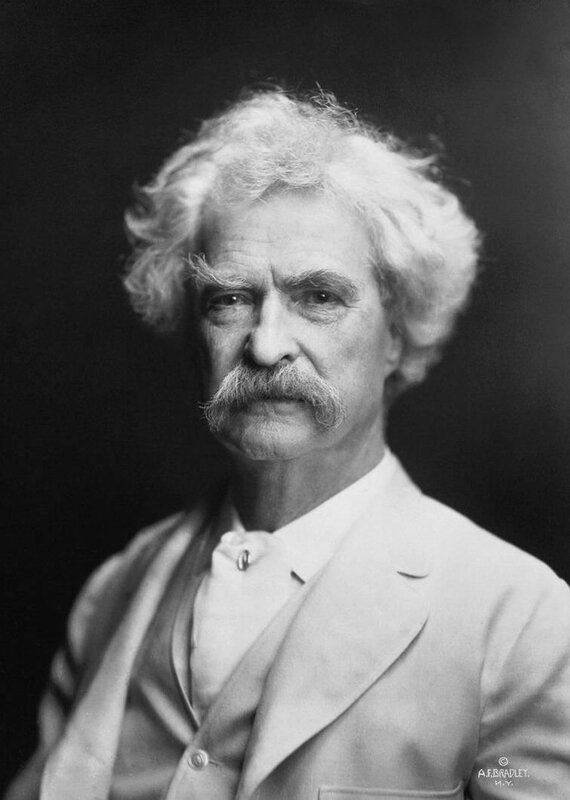 August 1895 was an excessively dry month in all parts of the state.... On many days that were otherwise clear the sun was almost entirely obscured by excessive smoke from forest fires, which extended over a great part of the eastern, as well as the entire western section of the state. 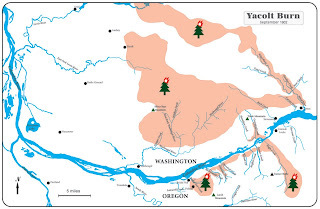 A few years later, a huge fire--the Yacolt Burn--- burned 238,000 acres in Clark, Skamania, and Cowlitz counties resulting in over 65 deaths. The fire dropped one-half inch of ash in Portland. The smoke was so thick that street lights glowed at noon in Seattle 160 miles away and ships on the Columbia River were forced to navigate only by compass. It makes our recent experience seem like a walk in the park. But the real show stopper was the Big Burn of 1910, which destroyed 3 million acres and killed 87 people, a vast area encompassing parts of eastern Washington, northern Idaho, western Montana, and parts of BC. The Big Burn was a turning point in many ways, pushing the U.S. government to get into fire suppression on a massive scale. At first, our technology and organization was not up to the job and major fires continued, such as the Dole Valley Fire of 1929 that burned over 300,000 acres in Clark and Skamania counties. But by 1940s, we became very good at it. Active suppression kept down the number fires and quickly extinguished most of the ones that did start. 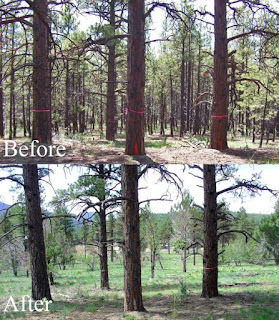 Forests that once encompassed big trees with substantial spacing between them, started to fill in as the big trees were removed and the absence of fires allowed dense, unhealthy stands of smaller trees to develop. We created sick forests where beetles and other insects did great damage, untempered by frequent fires. Degraded forests, where huge amounts of "fuel", enhanced by slash left on the ground by careless logging, became primed for huge, catastrophic fires. And we decided to expand our homes and recreation in to the forests, endangering the new residents and initiating many fires. Today, the bill for our suppression of fire and poor forest management in the Pacific Northwest and British Columbia has now come due. 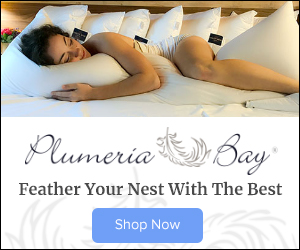 Those who blame our dangerous situation on a "new normal" solely resulting from climate change, are not only misinformed, but they can act as obstacles to the actions that are acutely needed: a massive effort to thin our forests and bring back low-intensity fire. Some enlightened politicians, like Senator Maria Cantwell, are calling for such an approach...they should be supported. Warming from increasing greenhouse gases is surely making the situation a bit worse, and its impact will undoubtedly escalate when the real warming occurs later in this century. But today, global warming is a relatively small element of the current wildfire situation, particularly in the slow to warm Pacific Northwest. As citizens of one small region, there is only so much we can do to stop global warming. But we can fix our forests, improving the fire/smoke situation today and preparing for the greater warming that is undoubtedly in our future. Marine air is now pouring into western Washington, rapidly replacing the warm and smoky air that has been in place since Sunday. Wind chimes are ringing, leaves on trees are rustling, window shades are banging, the smell of smoke is fading, and there is a feeling of normality and well-being. The normal balance of nature is being restored. It is almost a religious experience. Temperatures at 9 PM at Sea Tac was 65F tonight...it was 79F last night....an impressive 14F decline. And we are just getting started. Visibility has improved at all regional airports. What you really want to know about is air quality. The HRRRsmoke model forecast for 9 PM shows the coast pretty clear, but with residual smoke inland, particularly over central Puget Sound. That is consistent with the red moon I see outside. But the story at 9 AM Thursday is amazingly better, with the lowland pretty much cleaned up, with the sole exception being around the Maple fire over the SE Olympic mountains and its plume extending to the NW. Those living in western WA will feel energized and reborn. But as in life, there are winners and losers. Western Washington wins. Eastern Washington loses. 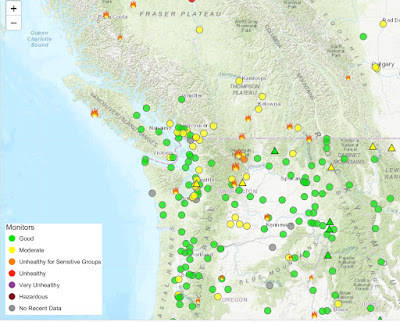 Smoke from fires over the eastern slopes of the Cascades will flood eastern WA and Idaho, and increasing winds associated with the changes will increase fire threats on the eastern Cascade slopes. Enjoy the change. 7AM Update: Here is the particulate levels (PM2.5) ending 7 AM in Seattle. Huge drop. The 9:10 AM visible satellite image shows low clouds engulfing western Washington, but eastern Washington covered in smoke. Want sun and not much smoke? Head to the upper western slopes and crest of the Cascades! Ash was falling last night around Puget Sound, with white flakes apparent on many cars. And air quality is terrible right now, about as bad as it has been during the entire extended event. But relief is close at hand, with dramatic improvement guaranteed tonight and tomorrow. 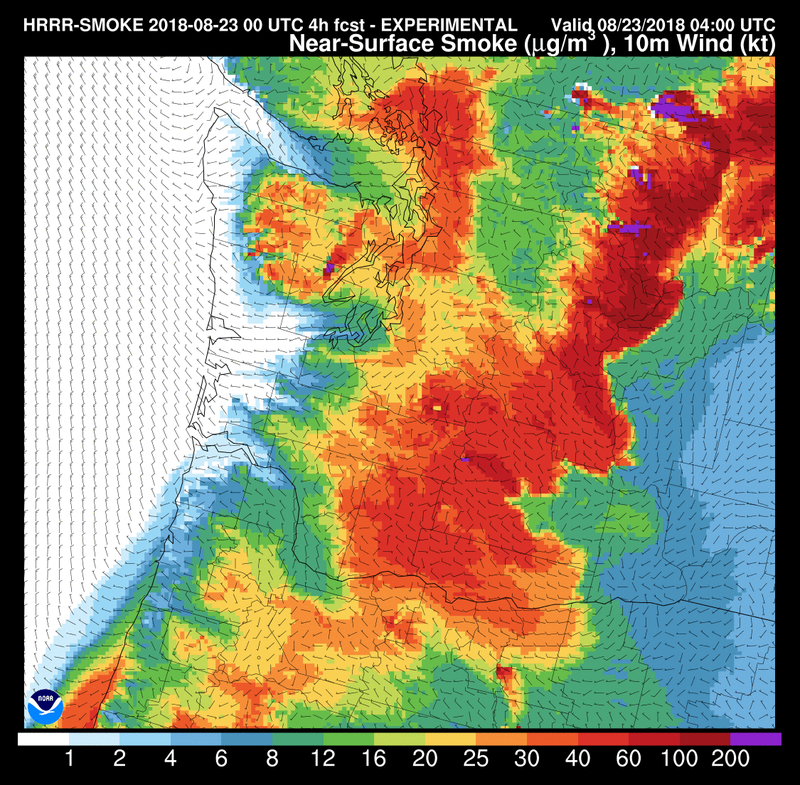 And it more that obvious in the forecast smoke concentration for 8 AM from the NOAA/NWS HRRR smoke plot. Apocalyptic. The vision of Smokezilla. 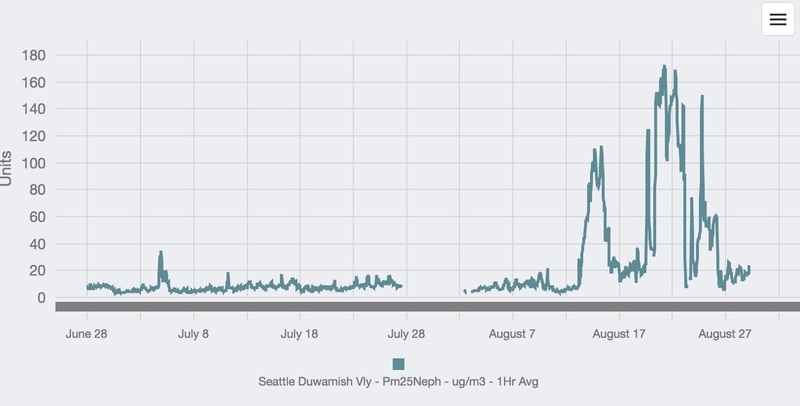 The small particle concentrations (PM2.5) measured at Seattle (Dwamish) and north Seattle (Lake Forest Park) illustrates the sustained high values and they have been rising overnight to about 150 micrograms per cubic meter. These are unhealthy levels and twice those being observed in Beijing right now. An issue that has not been discussed is the effects on our temperatures. The dense smoke has greatly reduced solar radiation reaching the surface. Although yesterday still got to around 90F in our area, without the smoke, temperatures probably would have surged to the mid to upper 90s. But the most interesting issue is our LOW temperatures. Notice how warm it has been at night? 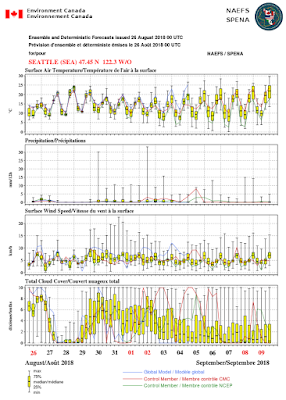 To illustrate, here is a plot of the temperatures at SeaTac Airport for the last 4 weeks, with normal highs and lows plotted. Notice how our low temperatures have been crazy warm the last two days? (see the dashed oval). Like 10F above normal. That is due to the smoke layer, which acts as a blanket, reducing the ability of the surface to lose heat to space through infrared radiation. Now the good news. The end (of the smoke) is near. The easterly flow above the Cascades has weakened, reducing the smoke supply. And later today onshore flow should rev up, bringing in cooler, cleaner marine air. 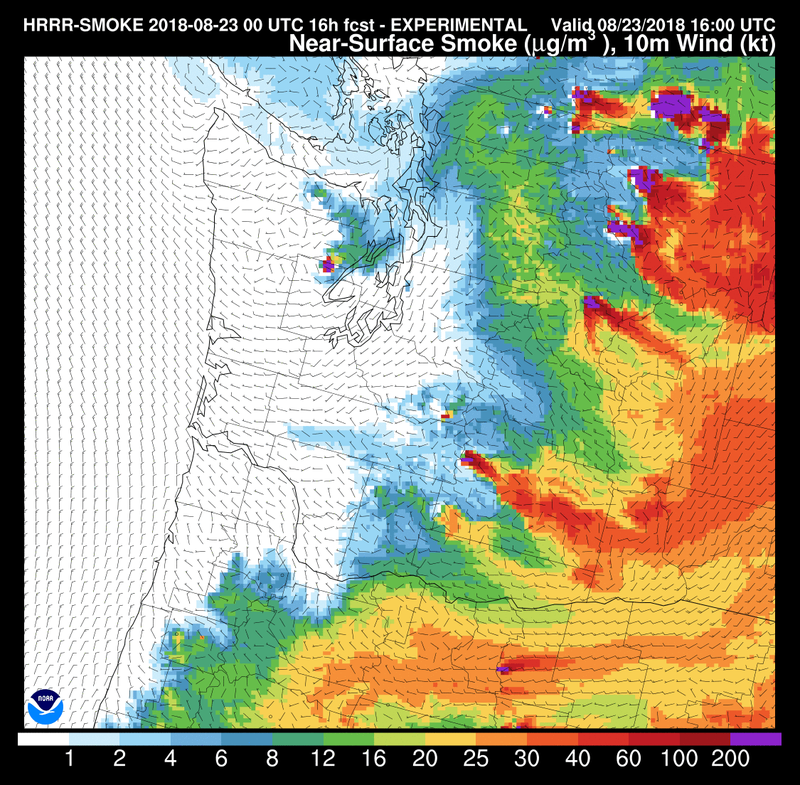 Here is the HRRR smoke forecast for 5 AM tomorrow morning. Clean air (white) is moving inland and is about to reach Seattle. 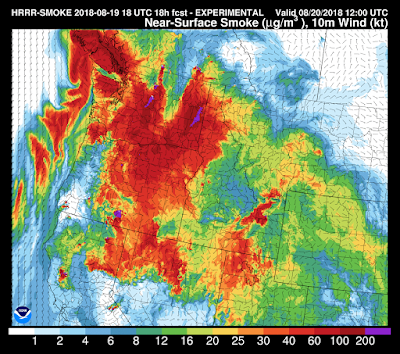 Not good for eastern Washington and Idaho since the smoke will be blown eastward. And increasing winds could stoke the fires. 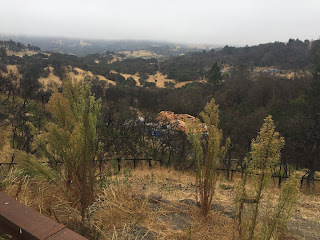 Finally, I am working on two future blogs on the wildfire issue, something that I have become very interested in. The first will describe how our smoke is not a "new normal" but a return to the "old normal" (there were far more fires and smoke during the early 20th century and before). The second will talk about the cause of this situation, with the key issue not being climate change (which does contribute) but our mismanagement of our forests, nearly a century of fire suppression, human intrusion into wildlands, and flammable invasive species. 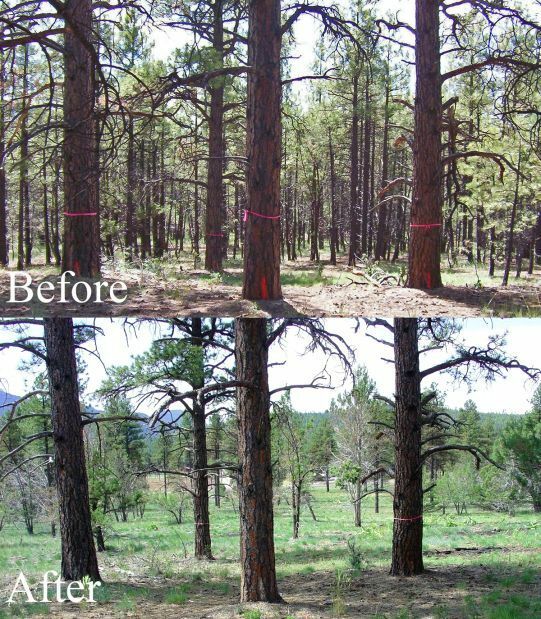 And I will suggest that there is a real opportunity for a bipartisan, non-political effort to fix our forests. 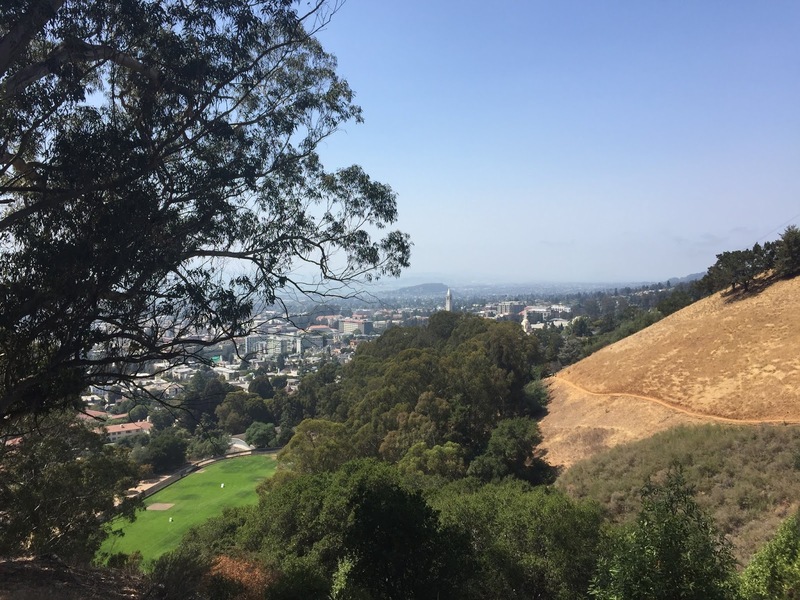 Folks were surprised how quickly the air quality deteriorated Sunday afternoon, rapidly going from moderate air quality to unhealthy conditions with a profound loss of visibility. 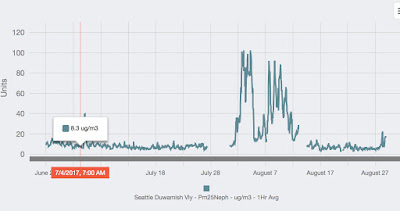 Things improved over night around Seattle, but then went downhill today--with the worst hourly smoke levels on record (back several decades). Let me show you and explain the fascinating and complex situation we are in. 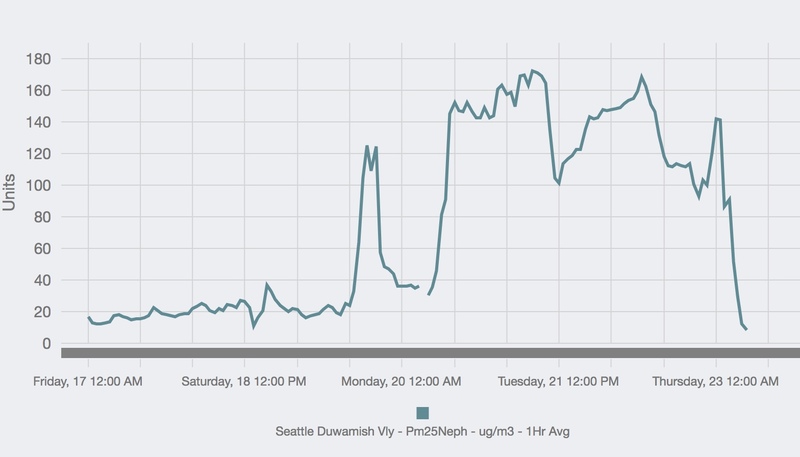 Here is a plot of the particulate levels (PM2.5) at the Puget Sound Clean Air Agency Duwamish site from last Tuesday to 3 PM today (Monday). You can see the rapid surge of smoke yesterday afternoon, followed by a sudden fall in yesterday evening. And then it started rising again this morning, reaching a peak now that is far higher that either yesterday or last week. In fact, this hourly smoke level is the highest on record at this site (going back roughly two decades) and higher than anything last summer--the plot below is the proof! 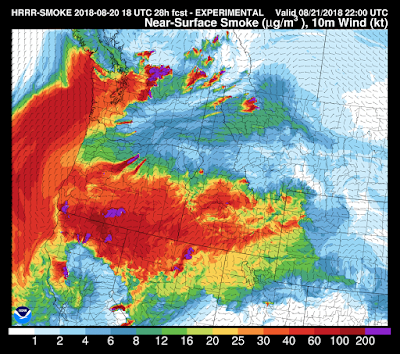 Yesterday, as the winds aloft turned northerly and northeasterly, the huge reservoir of smoke in British Columbia and eastern Washington surged southward overhead, but air quality did not decline immediately. As the surface warmed, the lower atmosphere started to mix, higher and higher, eventually tapping the smoke aloft and bringing it down to the surface. That is what caused the air quality to rapidly degrade. Last night, the surface cooled, the mixing driven by surface heating dropped off, and the lower atmosphere became stable, with little vertical mixing. So we stopped tapping the smoke aloft. Then relatively clean air moved into central and northern Puget Sound from the Strait of Juan de Fuca, leaving us with better quality air, which was present this AM. But why did things get so bad this afternoon? For one thing, the surface started to warm, resulting in more mixing of smoke down to the surface. The noon MODIS satellite imagery clearly showed smoke above the region and particularly Puget Sound. Eastern WA looks like something out of Dante's Inferno. But look really closely. You can see smoke plumes over the eastern slopes of the North Cascades, with the smoke moving toward Puget Sound. The 3:40 PM satellite image from the NOAA GOES satellite shosw the smoke from these fires crossing the Cascades and reaching Puget Sound. Some domestic smoke. A source of primo smoke aloft. 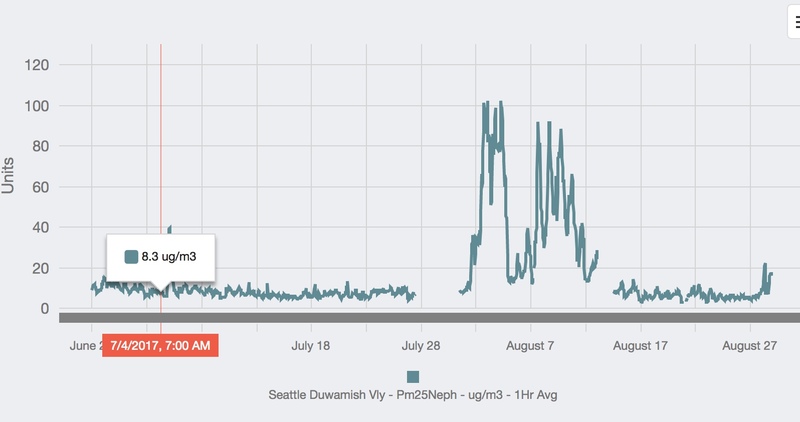 As illustrated by the EPA AirNow graphic, although it is smoky over Puget Sound, it is crazy bad in Port Townsend and Port Angeles, as well as areas along the eastern slopes of the North Cascades where the numbers are in the 200s. Extraordinarily unhealthy. What about the future? 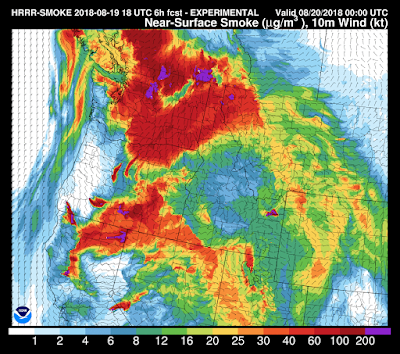 Let's check out the NOAA HRRR smoke forecasts, which have proven to be stunningly good. 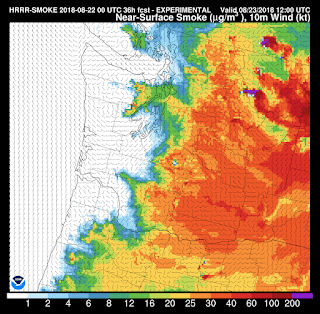 Tomorrow, the winds become increasingly easterly, which means eastern WA smoke will be coming right into us (see forecast for 3 PM tomorrow). Not much better than today. Wednesday is the transition day, with a onshore, marine push beginning that evening. Thursday, should be a MUCH better day, with clean ocean air over our region. 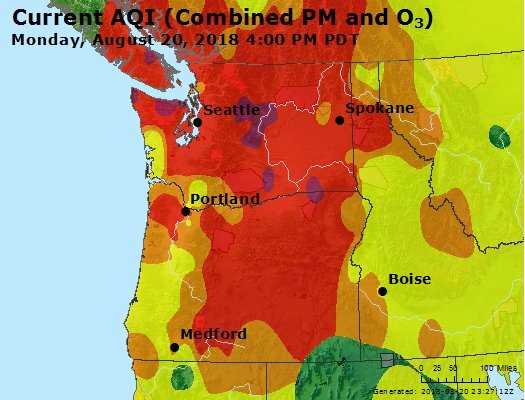 On a lighter note, the Puget Sound Clean Air Agency gives advice on what you should do in this smoky situation. The only thing advisable is to work on your laptop! 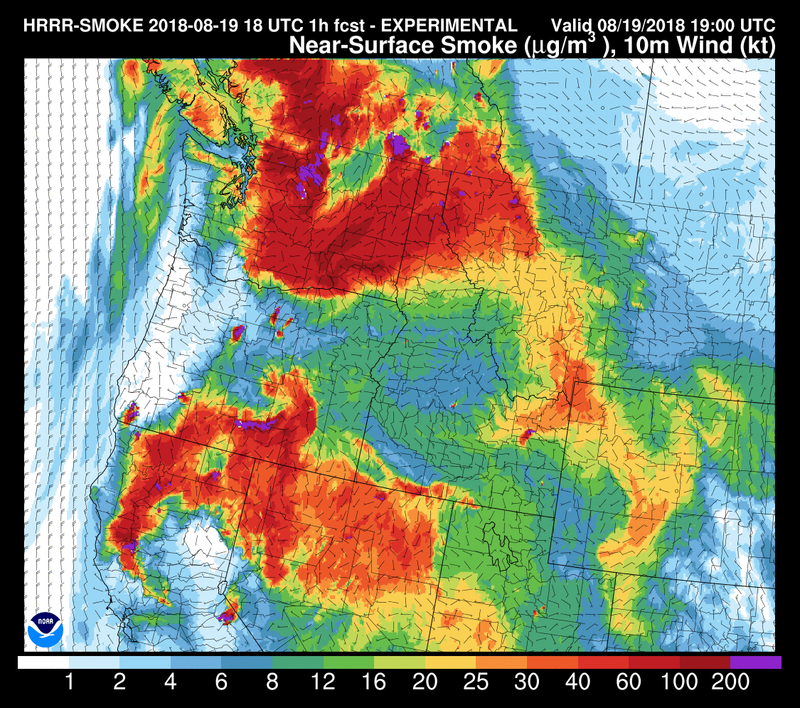 During the next 12 hours there should be a major influx of wildfire smoke into the lower elevations of western Washington. The MODIS satellite imagery around noon showed very dense smoke over eastern WA and the north Cascades, with lesser but substantial smoke now over northwest Washington, with a thinning from Seattle southward. The 2PM image from the GOES geostationary satellite, indicates the smoke is slowly moving southward west of the Cascade crest. The backdrop of Seattle is getting murkier over time. And fully entrenched at 5 AM Monday. These forecasts are for higher concentrations than in the forecasts for last Wednesday, our last big smoke day. The movement of smoke will be supported by a change in the winds aloft. The following maps the predicted winds (barbs) and temperature (color) at around 5000 ft (850 hPa). Major strengthening of northerly to easterly winds during the next 24 h. The first map is for 11AM Sunday....weak wind from the SE. By 11 PM, moderate NE winds will be blowing smoke right into us. And easterly flow will be in place at 11 AM Monday....pushing the smoke our way. Not good. So get rid for a major smoke event. 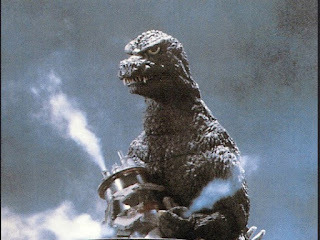 No, I am not going call it Smokezilla.